Stephen Rodriguez has been building gas kilns since 1988 for potters and art centers in the northeast. Each kiln is modified for the needs of the potteries, based on the Brookfield Kiln design. This is a down draft kiln with a roman arch built of insulating brick and fire brick. 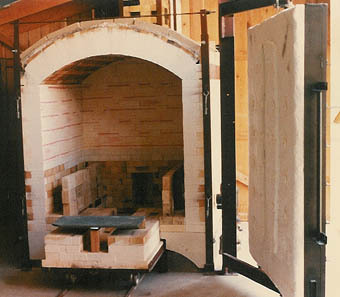 The most common variation of the Brookfield that he builds reduces the chimney to the height of the kiln, the burners are forced air, and a movable ceramic fiber door becomes the front face of the kiln. The interior volume ranges between 40 to 100 cubic feet. He has built kilns for Clay Art Center, Port Chester, NY; Creative Arts Workshop, New Haven CT; Wesleyan Potters, Middletown CT; and numerous private potteries. *Constructing the entire kiln: size and modifications are developed as per need. 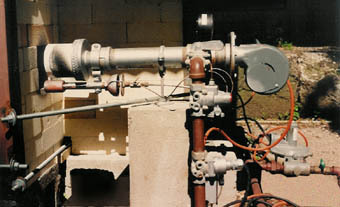 *Repairing and rebuilding used gas kilns.